On September 3, 1967, Swedes waking up to run normal Sunday errands had to account for a rather drastic overnight change. Starting that morning, all cars in Sweden had to drive on the right side of the road. It was Dagen Högertrafik ("H Day"), "right-hand traffic diversion day." 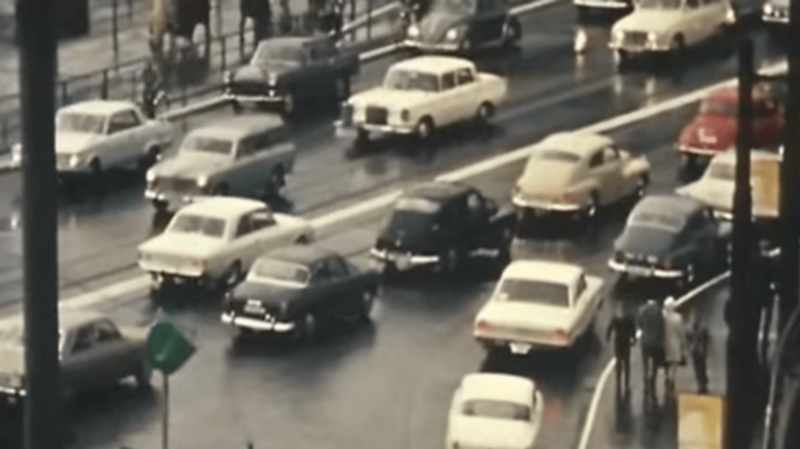 Since the advent of the automobile though September 2, 1967, Swedish motorists had been driving on the left. This was mainly out of habit. Carriage traffic in the 18th and 19th centuries flowed down the left side of Sweden’s narrow roads, and the tradition continued with cars even though most automobiles in the country were left-hand drive. Drivers sat all the way on the other side of the road from oncoming traffic, and authorities feared this contributed to accidents (especially head-on collisions). Sweden’s neighboring countries all had right-side traffic patterns, and border crossings played out like a game of chicken in ultra-slow-mo. For decades, Swedish authorities wanted to institute a change, though the public was vehemently against it. A referendum was held in 1955 on the matter, and Swedes came out in droves to reject the switch—82.9 percent of voters insisted they still wanted to drive on the left. In 1963, the Swedish Riksdag eschewed public opinion and decided to finally make the change. They circled a date that would give everyone enough time to prepare: September 3, 1967. A country doesn’t simply wake up one morning and start following new traffic rules in perfect unison, though if there were one such country, it would likely be Sweden. Authorities treated Dagen H as a public safety measure and social experiment rolled into one. According to Time, psychologists were hired to talk with drivers and pedestrians to gauge concerns and help determine the most effective ways to promote the change. A massive PR campaign was launched to alert everyone of the upcoming H Day. Swedish television held a songwriting contest to find the best ditties about driving on the right side of the road. A Stockholm department store sold men’s shorts emblazoned with a big “H” on their butts. Around the country, signs were erected to serve as reminders—they simply read “3.9 1967.” By Dagen H, everyone knew what they meant. In preparation for the change, Sweden's road network had to be readied through a myriad of projects. Street and highway signs around the country were to be reversed or changed. Bus stops were moved across streets. In Sweden’s biggest cities, trams were removed from their tracks and replaced with buses that featured doors on their right-hand sides. New traffic signals were installed but shrouded in black plastic, waiting for the big day to be unveiled. Starting at 1 a.m. on the morning of September 3 (and as early as 10 a.m. the previous day in large cities like Stockholm), no one in Sweden was allowed to drive. The roads were cleared of non-essential traffic until 5 a.m. and, throughout the night, state employees went to work. Crowds started gathering in Stockholm’s biggest intersections around 4 a.m. According to a Glasgow Herald reporter, the event was treated “almost as a festival.” Fireworks filled the light Scandinavian morning sky and “singing from an impromptu choir” rang out. At a busy junction, the Scottish journalist watched what looked to be “every taxi driver in Stockholm” line up in anticipation. At 4:50 a.m., “cycles and taxis were guided across the road by the police.” They would never drive on the left side ever again. In Sweden’s larger cities, civilian traffic wasn’t permitted to return to its normal levels until the afternoon, but by early evening the entire country had flip-flopped over to the right side of the street. Accident levels returned to normal after six weeks, and the dip immediately after the change was likely the result of highly prudent driving. Still, Dagen H is seen as a success that is unlikely to ever be repeated on such a large scale. Feel free to celebrate Sweden's achievement today by letting your hair down and driving on the correct side of the road in an orderly fashion.